This article originally appeared in the Beacon’s print edition on Nov. 22. At a “Money Matters” discussion last Thursday, almost any topic relating to women and finance was fair game. Trade Director Karia Christopher, the chairwoman of the Financial Services Commission’s Financial Education Network, led the open-ended conversation, urging about 100 attendees — a majority of whom were women — to speak their mind. Money Matters BVI, a programme aimed at “demystifying” finance through a variety of different methods, was established by the FSC in 2011. And last Thursday, its method was a “lunch and learn” event that catered to women of varying ages and focused on the themes “women and money” and financial abuse. 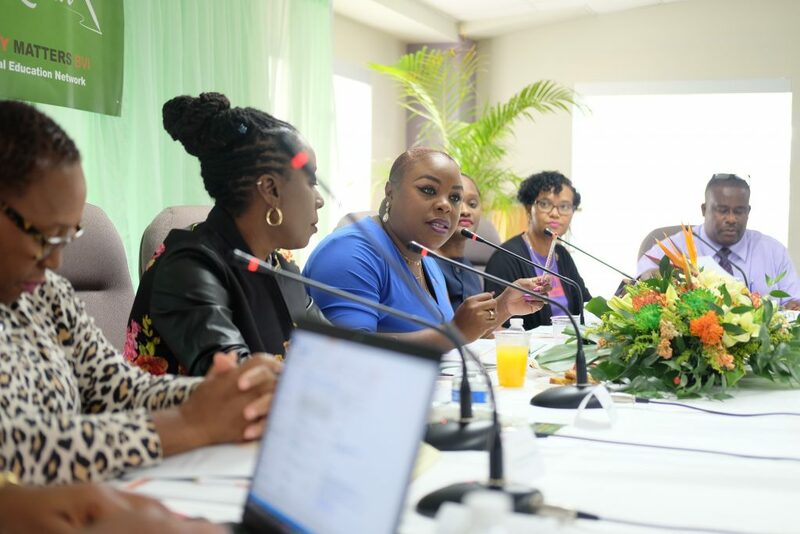 Chief Social Development Officer Annie Malone Frett, who helped answer audience questions and provide information alongside Ms. Christopher and other panel members, emphasised the importance of having a financial plan. “Nobody goes into a marriage hoping that it will end, but in the event that it does, then there are other things that we need to look at in terms of how women can necessarily secure themselves and come out on [a positive] end of that arrangement,” Ms. Frett said. Thursday’s discussion was not without spirited debate, however. Robert Mathavious, the managing director of the FSC, chimed in to the conversation, arguing that the territory’s older generation of women should be congratulated for competently managing their households’ finances. Younger women in the Virgin Islands should learn from them, he added, and avoid spending their money on “frivolous” things. Several panellists responded to Mr. Mathavious’s comments, attempting to add more clarity and depth to his points. FEN Deputy Chairwoman Desiree Smith, government’s chief information officer, said individuals should use the goals that “fuel” them to direct how they spend their money. “People who make up society are dynamic, living entities and so we’re not able to just strictly oftentimes follow the way of the past,” she said. Conversations within the second portion of the event focused on different types of financial abuse, especially as it pertains to the territory’s elderly. A large group of seniors attended the event and spoke openly about challenges they’ve faced. One woman told the group that when her husband died, she discovered he didn’t have a will. Jenelle Archer, a senior associate at O’Neal Webster, added that some seniors may believe that younger relatives are automatically better equipped to handle their assets. “Seniors, because they’re older, and I think after a certain point in their lives they become a bit socially isolated, and because of that isolation and that lack of constant communication with other persons in society, they feel that they can only rely on immediate family, and that is not necessarily the case,” Ms. Archer said. Elderly people should try to be social, stay aware of what’s happening around them, and avoid isolating themselves, she advised. Ms. Christopher concluded the event by urging attendees to talk about finances with friends and family and to make changes in their financial lives. “We hope that today this moment stimulates a conversation you will have as you go home, as you leave this building, with your co-workers and your team members and especially your elderly parents or grandparents,” she said.